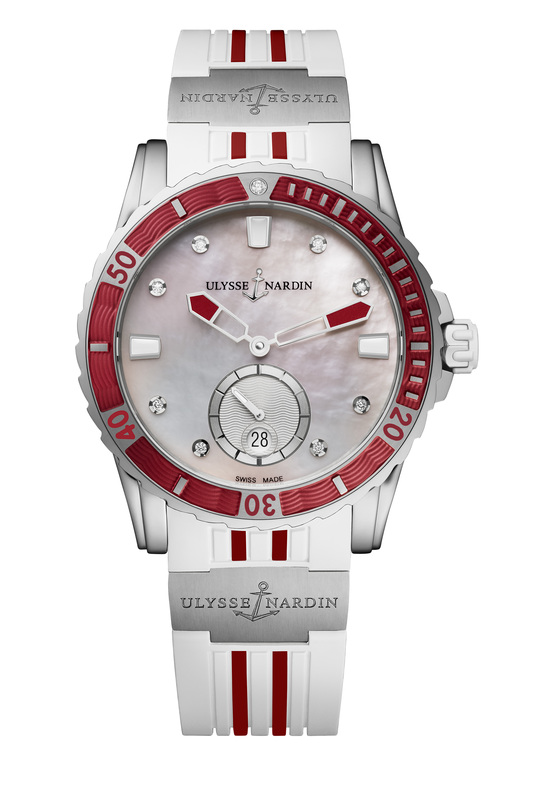 The timepieces from the Ulysse Nardin Lady Diver Collection is a combination of fine jewelry watches and reliable diving instruments. A favorite among women who demand exquisite style and superb performance. The pieces create embody the spirit of innovation, quest for independence and commitment to exacting execution and unparalleled design. In this collection, glamorous touches meet sophisticated capabilities. On various watch faces, the delicate aesthetic of mother-of-pearl can be found, contrasted only by the deepest shade of black on others. A wealth of diamonds diffuses endless sparkle on every piece. Eighteen-karat gold delivers classic elegance, as stainless steel expresses modern sportiness. Rubber straps fuse beauty and strength. 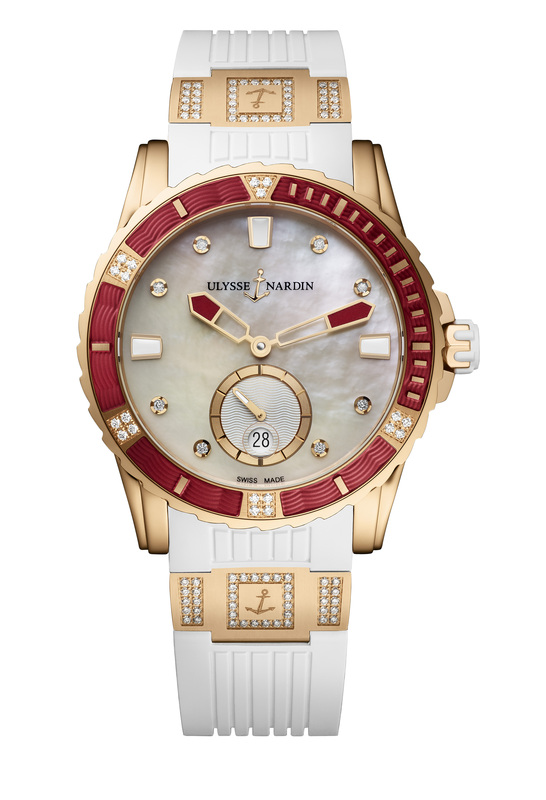 In one model, a precious metal insert is decorated with an array of shimmering diamonds and is complemented by the signature Ulysse Nardin anchor. 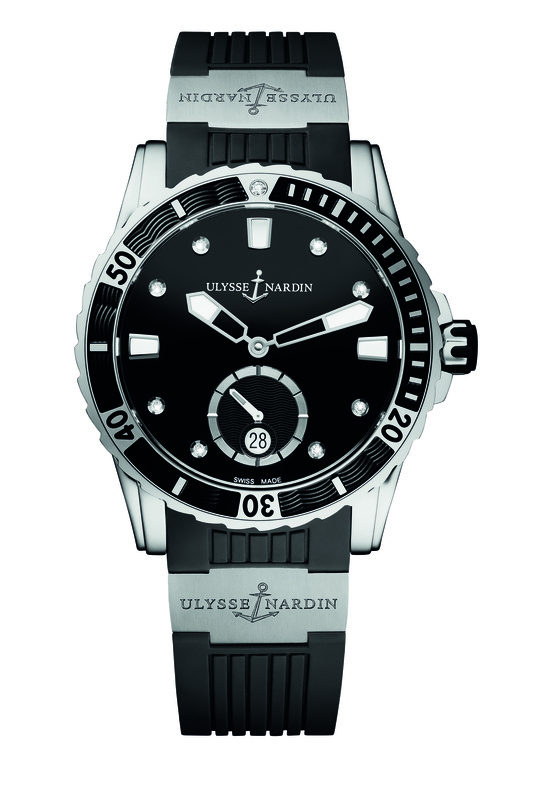 In another, a stainless steel insert is adorned only with the Ulysse Nardin anchor for timeless appeal. With this collection, there are a plethora of options from which to choose. The hard part will be deciding. The timepieces are structured with the in-house UN-320 movement, the Lady Diver features the revolutionary silicium technology via its silicium hairspring and anchor escapement, providing supreme accuracy, as well as simple forwards and backwards setting of the date located at 6 o’clock. In this same location, one can also make note of the small seconds. The dial, with its large luminous hands and hour markers at 12, 3 and 9 o’clock, improve readability. Below the surface, the timepiece is water-resistant to 300 meters. Its screw-locked crown helps prevent water from penetrating the watch, while its unidirectional turning bezel with rubberized inlay allows for necessary adjustments with one easy motion – a critical function for divers. A diving watch, beachside accessory or both, for the active lady without sacrificing luxury.